Music of Flight and Fantasy will feature musical selections that celebrate stories, characters, and adventure. The program will engage the imagination and delight individuals using the narratives and music from ET, Harry Potter, Star Wars, Willy Wonka and The Chocolate Factory, and The Wizard of Oz. Ballet dancers featured in Tchaikovsky’s Swan Lake give the audience a sense of flight and fantasy. Guest soloists will enhance the experience with live drawing, singing, and musical solos. Cost of Attendance: All tickets are $15! Kinesthetic Room –Join the Pittsburgh Ballet faculty for creative movement activities! Musician Meet & Greets – Meet and hear members of your Pittsburgh Symphony Orchestra. Quiet Room – If you need a moment, visit this room equipped with bean bag chairs, weighted lap pads and neck rolls, noise-canceling headphones, play mats, and coloring materials. Picture This – Take a picture with your favorite character cutout in the Grand Lobby. Dress up and become a character on the Music of Flight and Fantasy program. Share your photos on social media at #PSOsensoryfriendly. Sound Exploratorium – Explore percussion instruments, singing, and movement with our friends from Children’s Hospital of Pittsburgh of UPMC Music Therapy! Fiddlesticks’ Art Room – Create one or more flight and fantasy inspired art projects. Don’t forget to visit Fiddlesticks, our feline musical ambassador to children! Watch for pre-visit materials on pittsburghsymphony.org/sensoryfriendly. Created by Roger Ideishi, JD, OT, FAOTA and Rochelle Mendonca, PhD, OTR/L from Temple University in Philadelphia, these materials assist in preparing you for your experience at Heinz Hall and in enhancing your learning. Training for ushers, volunteers, staff, and musicians to help Heinz Hall personnel to foster an especially welcoming and inclusive environment. Relaxed rules in the concert hall so that all responses to the music – clapping, singing, vocalizing, moving, dancing, etc. are welcome at any time. Partially raised house lights in the auditorium to facilitate ease of movement in the Hall. Free fidgets and earplugs to help patrons regulate their sensory stimulation. A designated quiet space with relaxing activities and a live video feed of the onstage action for patrons who would like to take a break from the pre-concert activities and/or performance. Slight mitigation of sudden, loud sounds during the performance. A family restroom located on the lower level. Gluten and casein-free concession options. A modified refund policy that allows families to receive 100% of their money back if they purchase tickets and find they are unable to attend the day of the performance. 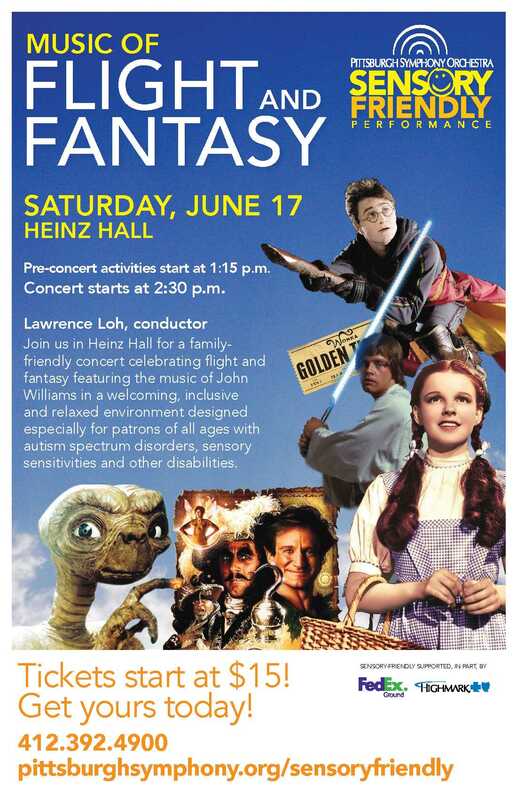 Additional Accessible Services: In addition to the services available at all Heinz Hall performances (curbside assistance, accessible entrances and seating, an accessible restroom, and portable FM assistive listening devices and hearing loop), we will have a family restroom, Braille programs, large print programs, ASL interpretation, and Communication Access Real-Time Translation (CART) at the concert. Funding: Generous support for this concert was provided in part from the following: FedEx Ground, Highmark Blue Cross Blue Shield & Allegheny Health Network, The Jack Buncher Foundation, and Pirates Charities.